A stitch can usually be felt to one side of the abdomen, more often the right side, around the area of the lower ribs. Many people suffer from stitches when doing sport, particularly running based activities. We examine the possible causes and what you may be able to do about it. 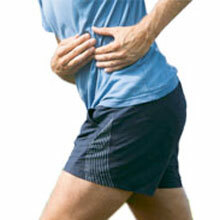 Most cases of abdominal pain during exercise are referred to as a ‘stitch’ or side stitch. It is also known as an ‘exercise-related transient abdominal pain’ or ETAP. Stitches are very common, especially in running and swimming, with up to 70% of runners experiencing a stitch in the last year. The cause of a stitch is not known and there are several theories doing the rounds. These include eating too close to exercise, a cramp in the diaphragm due to a decrease in blood flow, not warming up thoroughly. It is also suggested the liver tugs on the ligaments which connect the liver to the diaphragm. In order to relieve stitch pain, try stopping, leaning forwards and breathing out hard whilst pressing into the painful area with your fingers. Other treatments include breathing techniques such as belly breathing and altering which foot hits the ground when you exhale. Most people exhale as the left foot hits the ground – try changing this so it’s the right foot. Other causes of abdominal pain in athletes include pain referred from the thoracic spine.